The nominations for the 67th Tony Awards were announced this morning. At least two of the nominees have connections to Little Rock. Little Rock native Will Trice, who won a Tony Award last year for producing the revival of Porgy and Bess, has been nominated for producing this season’s revival of Who’s Afraid of Virginia Woolf? That production earned a total of five nominations. Trice (who is an associate of one of Broadway’s leading producers Jeffrey Richards) was also represented on Broadway this season with a revival of Glengarry Glen Ross and the new play The Anarchist. He is currently working on projects for next season including a transfer to Broadway of an acclaimed revival of The Glass Menagerie which stars two-time Tony winner Cherry Jones, two-time Tony nominee Celia Keenan-Bolger and Zachary Quinto. 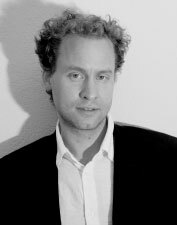 Japhy Weideman received a Tony nomination for his lighting design of the new play The Nance. For several seasons, Weideman was a lighting designer at the Arkansas Repertory Theatre. Though he has extensive credits Off Broadway, in regional theatres and in opera, this season is Weideman’s first on Broadway. He also designed the lighting for a Broadway revival of Cyrano de Bergerac earlier this season. In 2005 and 2007, Weideman received Drama Desk nominations for his design of Off Broadway productions. His recent theatre credits include two Pulitzer Prize finalists: 4000 Miles and Sons of the Prophet. His work has been seen throughout the US, Scotland, England and Greece. Yesterday focused on the entrance to the old Museum of Fine Arts. When the new Arkansas Arts Center opened in May 1963, the architectural firm of Ginocchio, Cromwell, Carter, Dees & Neyland (now the Cromwell firm) had designed a new entrance. This one created a more modern look and reoriented the building toward the south and MacArthur Park. Just off the entrance and lobby are studios, galleries and a theatre. Since the 2000 renovation and expansion, this has functioned as an entrance for the Museum School and the Children’s Theatre and is now most commonly referred to as the lower lobby. As this is the last day of April, it will be the last daily Architeaser. Starting in May, it will shift to a twice a week (generally Tuesdays and Thursdays) feature. The Arkansas Repertory Theatre works in partnership with the Clinton School of Public Service to participate in the UACS’s Distinguished Speaker Series, hosting educational panel discussions on various Rep productions. The latest in these takes place today, Wednesday, May 1 at 12 noon at Sturgis Hall in Clinton Presidential Park. Join Rep Producing Artistic Director and Death of a Salesman director Robert Hupp as he hosts the cast from The Rep’s current production. Why do critics call Death of a Salesman the greatest American play, and what relevance can audiences draw from this 50 year-old production? Call the Clinton School at (501) 683-5239 for reservations. 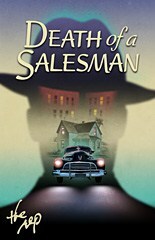 Death of a Salesman opened last Friday night and runs through May 12. Wednesday, Thursday and Sunday evening performances are at 7 p.m., Friday, Saturday evening performances are at 8 p.m. Sunday Matinees performances are at 2 p.m.
Later this week the Arkansas Arts Center will host its Tabriz fundraiser event. In keeping with that, today’s Architeaser features the entrance to the old Museum of Fine Arts in MacArthur Park. 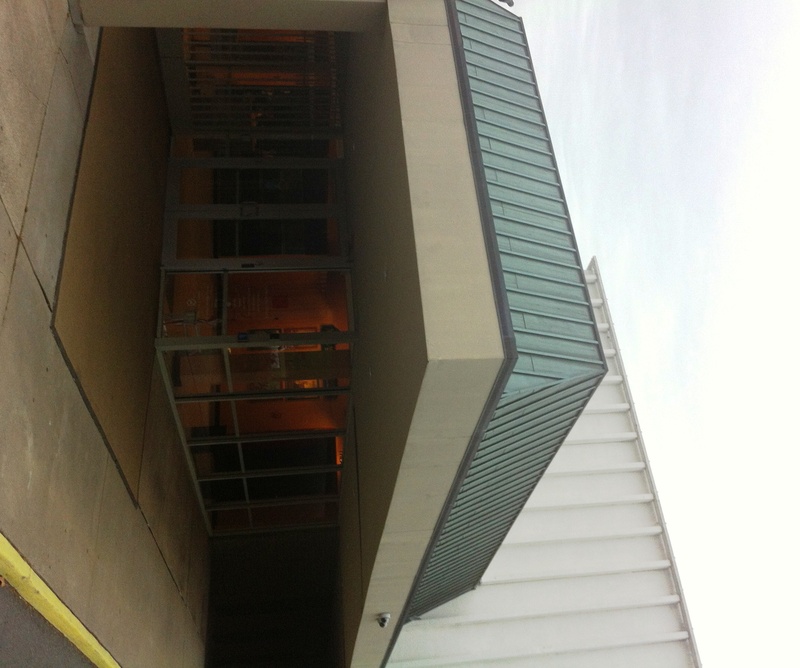 When the Museum was reorganized into the Arkansas Arts Center and the building was expanded, the former entrance was incorporated into the new building. The original building was designed by architect H. Ray Burks. It was built by the Works Progress Administration and incorporates the art deco and neo-classical elements which were usually found in WPA buildings. The entrance typifies this. 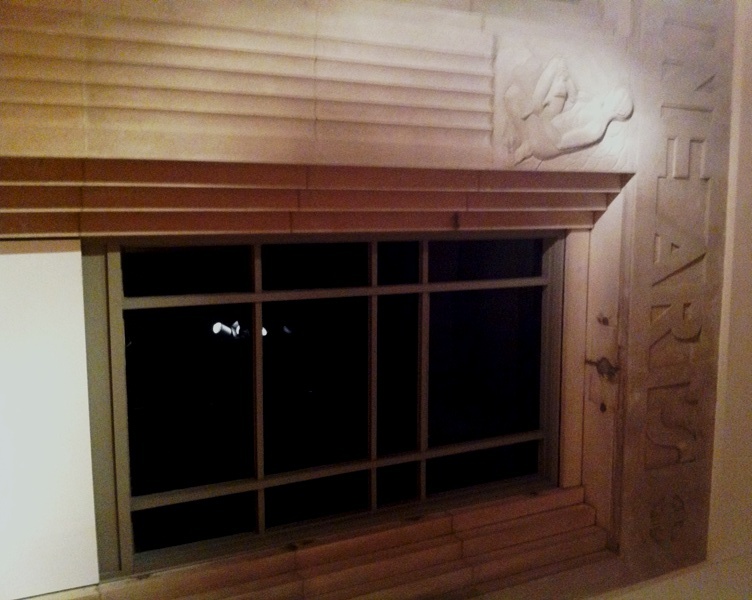 The arches contain the ridges, clean lines and fluting often found in art deco as well as classical figures in a frieze. Hawthorne wrote of Twice Told Tales. This week, Tales from the South offers two shows. On Tuesday, April 30, the program will focus on “Lost and Found” featuring stories by Mary Lester, Wetzel LaGrone and May Griebel. Music that night will be provided by Justin McGoldrick and blues guitarist Mark Simpson. On Wednesday, May 1, Heritage Month will kick off with a Historic Preservation of Arkansas show. It will feature stories by Deborah Carroll, James King and Sandra Hamilton. Mark Currey and blues guitarist Mark Simpson will provide the music. “Tales From the South” is a radio show created and produced by Paula Martin Morell, who is also the show’s host, in conjuction with Temenos Publishing Company. The show is taped live on Tuesday nights at Starving Artist Cafe’in the Argenta Arts District of North Little Rock, Arkansas. The program offers dinner and a show, and shows are $7.50 admission and open to the public. The night is a cross between a house concert and a reading/show, with incredible food and great company. Tickets must be purchased before the show, as shows are usually standing-room only. Doors open at 5:00pm. Dinner is served from 5:00 to 6:30pm (dinner price not included in admission charge). The program starts at 7:00pm. Advance reservations are required. On this date in 1883, future Little Rock Mayor Sam M. Wassell was born. His grandfather John W. Wassell had been appointed Mayor of Little Rock in 1868. He is the only Little Rock Mayor to be a grandson of another Little Rock Mayor. 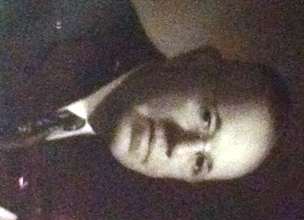 Sam Wassell served on the Little Rock City Council from 1928 through 1934 and again from 1940 through 1946. He is one of the few 20th Century Little Rock Mayors who previously served on the City Council. Wassell was an attorney. He practiced law privately and also served as an Assistant US Attorney. In 1930, he ran unsuccessfully for the Democratic nomination for the US Congress representing the 5th Congressional District, which at the time included Little Rock. Wassell ran for Mayor in 1947 and was unopposed in the general election. He was unopposed in his bid for re-election in 1949. During his second term, President Harry S. Truman visited Little Rock. In 1951, he sought a third term as Mayor. No Little Rock Mayor had sought a third consecutive term since 1923. Though he received the Democratic nomination, the Republican party nominated Pratt Remmel who defeated Wassell by a 2 to 1 margin. With a new USS Little Rock under construction, it is interesting to note that Mrs. Sam Wassell christened the previous USS Little Rock in 1944. At the time, she was a City Councilor’s wife. Mayor Wassell died on December 23, 1954 and is buried at Roselawn Cemetery in Little Rock. Mount Holly Cemetery is like an aging, but gracious Southern lady. She is in need of ongoing maintenance! Funds raised at the picnic will help maintain this historic landmark. Visitors will walk in Little Rock’s historical footsteps at the 9th Annual Mount Holly Cemetery Picnic. The Mt. Holly Committee calls this event Rest in Perpetuity. The Culture Vulture lovingly refers to it as Dining with the Dead. Silent auction of tours, elegant dinner parties and opportunities for exclusive events at Mount Holly Cemetery and many other items. Guests will have the opportunity to join in a historic tour of the cemetery, featuring famous and infamous residents of Mount Holly Cemetery or guests can enjoy a naturalist tour! You are invited to join us for a picnic on the grounds of Mount Holly Cemetery, 1200 South Broadway, Little Rock, Arkansas, on the last Sunday of April. This is our annual fundraiser to raise funds to maintain this historic landmark. Tickets are $75.00 for adults, $25.00 for children under 12. 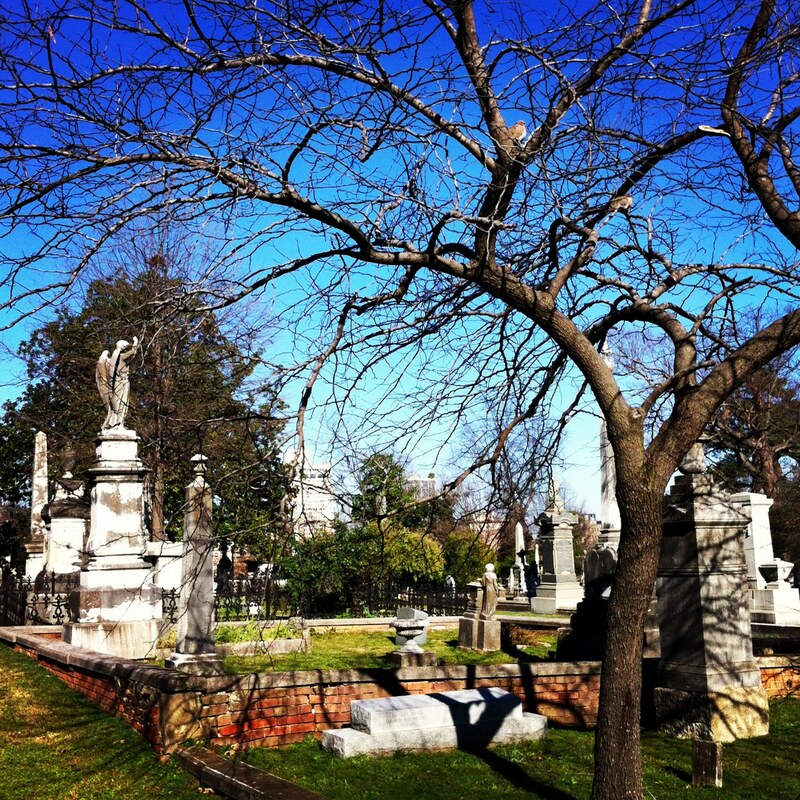 Dating to 1843, but with grave sites that date much earlier, Mount Holly is a “living and breathing” historical treasure in the heart of Little Rock’s Historic District.